It was over three years ago that the 38-year-old, chandelier-laden Mann National theater in Westwood was demolished--its death was to supposed to make way for a one-story retail structure from developer Ron Simms, but that has yet to appear (an overgrown lot that is routinely shaved down every six months currently occupies the spot). Now a mystery preservationist has left a memorial to the Mann, complete with a box of notecards for locals to leave their own personal memories--many have taken the offer. 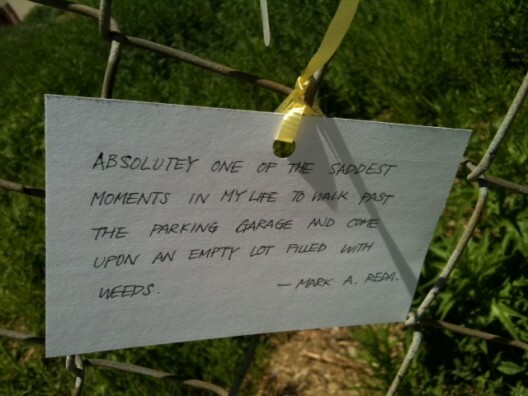 A notable missive from a Mark A. Reda: "Absolutely one of the saddest moments in my life to walk past the parking garage and come upon an empty lot filled with weeds." Across the street, the Hollywood Video is getting bulldozed to possibly make way for a 29-story hotel, but no one seems too torn up about that one. This same thing happened when they tore down Dublins on Sunset Blvd years ago, only to have it replaced with a club built on spec that has never been occupied.